Well.. lately I've been interested in a certain type of styling, involving normal everyday objects, just made very shiny. Like globes (as in one of my site-layouts from 2+ months ago), fruits (a recent attraction to an artists' wallpapers at DA), and the idea of the Yuugiou Duel-Stars from the Pegasus series. Not just that, but about a year ago as I was browsing wallpapers, I noticed a thumbnail, that at that time, I had seriously thought to look like clouds with dancing stars placed on top of them. When I clicked the thumbnail it wasnt even remotely close to being what I had thought it was (yes I got my eyes checked eventually). So combining that idea with the shiny object idea, I created this ^^. I wasnt sure if I should place it under Minimalistic, Fantasy, or Landscapes & Scenery.. I did keep the wall simple on purpose, but I think fantasy is the best fitting (if you think otherwise please let me know). At one point I was planning on creating a poem to pair with this wallpaper, and who knows, I may still write one. But for now nothing comes to mind, and I lack the time. Anyways, Above the Clouds features my shiny objects, my personal style, minimalism, fantasy, scenery/landscape, and my love for the moon, clouds & stars. Enjoy! Wow! The feeling this wallpaper gives off are just so cute! I absolutely love the colors and abstract-ness of it all. 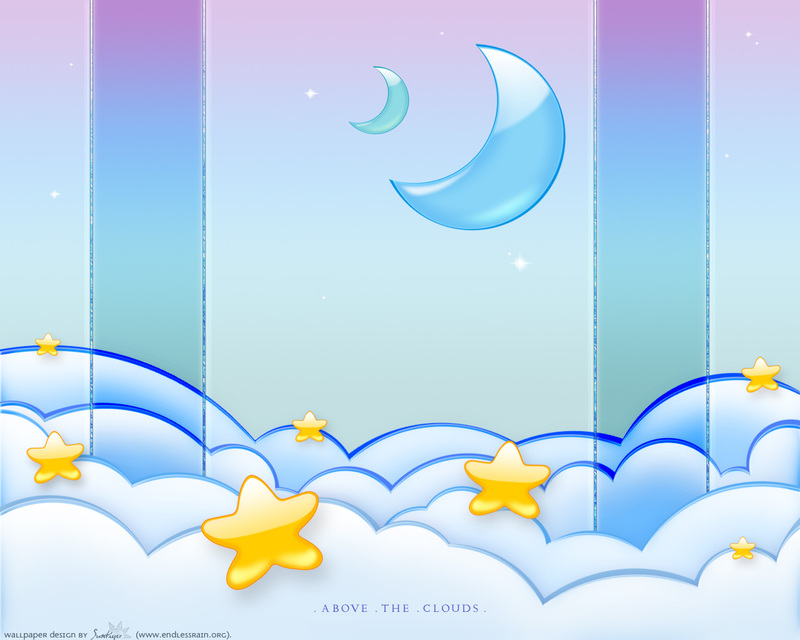 The stars and moons are very well made, it all just falls together to make one very high quality and stylish wallpaper! Proposed by Marissa and highlighted by bromithia. A very interesting idea, and the way you made it is extremely cute and yet stylish. ahh. its so cute and shiny. i really like the way the moon and the stars look. they are all so glossy and thats what caught my attention here. love the color use here. they are soft relaxing colors and are so peaceful and give me a feel of tranqulity. love the idea of dancing stars. a fav in my books. I love it; the borders on those two pillars (?) is so nice, yet the stars, moon, and the clouds look so cut and glossy. This is one of the cutest wallies i've ever seen! Such simplicity and yet it attracts me! Superb job! Woooooow ! IT IS SOOO KAWAIII ! *__* <3___<3 I LOVE IT ! I really clean and neat wallpaper, it is funny at first sight but then you realize about all the hard work that you put on it ....at least to make it look that clean and nice. great work. I love it! really great! wai~! Haahahaa! Somehow I'm expecting the Care Bears to come out, or a big giant Hello Kitty. Oh man, getting scared just thinking about that! I say it's very well done, I haven't seen many wallpapers like this, but not to my liking or tastes. Good job!